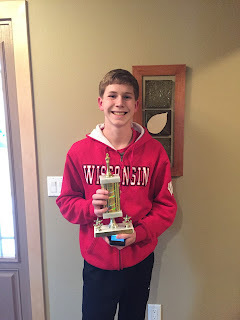 These are the final results for the State Championships put on last weekend on the UW Oshkosh campus, run by the Wisconsin Chess Association. 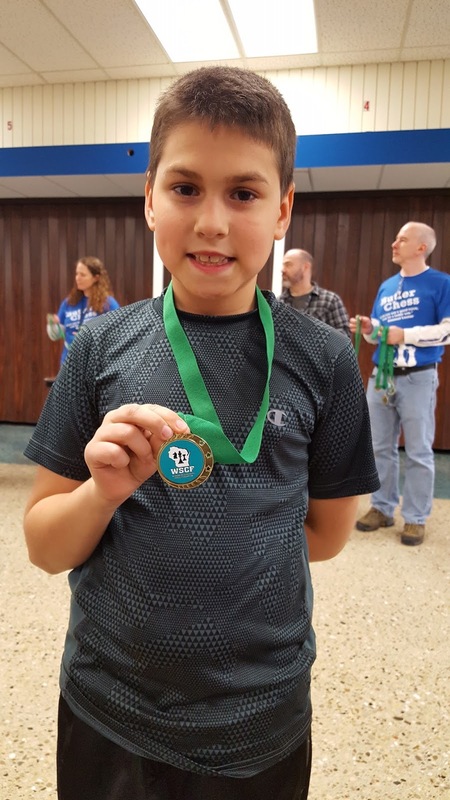 This tournament has been an annual tournament for our chess club for over 10 years. This year our club brought 11 players to a tournament with 413 players representing 85 schools across the state! These matches are much longer than our normal scholastic matches, lasting up to 2 hours each game on Saturday (4 rounds) and 3 hours on Sunday (2 rounds). Logan led the way with 4 wins. Close behind him was Yashika, Anthony, Andy and Rishi. Unfortunately because they represented 4 different schools, they could not form a team or they would have done well! Alyssa led the way with 4 wins and David was also right behind w/ 4 wins. Adam & Steven had 3 wins each and the four of them took home a 4th place team trophy for Bay Lane! 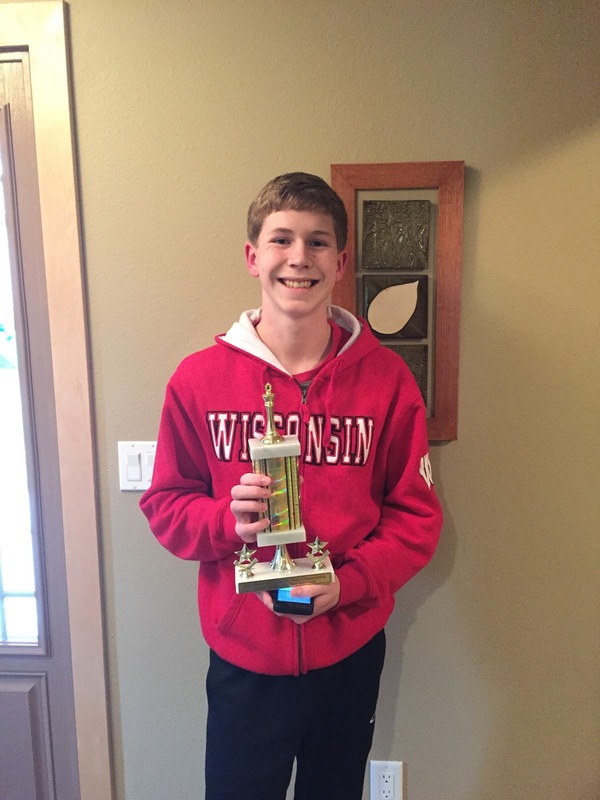 Will took 4.5 wins and a 9th place trophy! Aaron was right behind with 4 wins. These were some really tough matches - we were really proud of how our players performed, and with the good sportsmanship shown along the way. It was also very good to have Mr. Andy there for both days to go over games in between rounds. I have no doubt that our players had a lot of fun and emerged from this event stronger than ever. And perhaps the best non-chess part? The Best Western pool on Saturday night - total fun chaos!!! Last class of the school year tonight for the club. Wow what a big group of players at Elmwood this past Saturday - 183 over 4 sections! The MSCC also represented this tournament very well by bring 22 of our players, half of our club! It's always more fun to bring such a large group and I'm hoping we can do more of that next year. 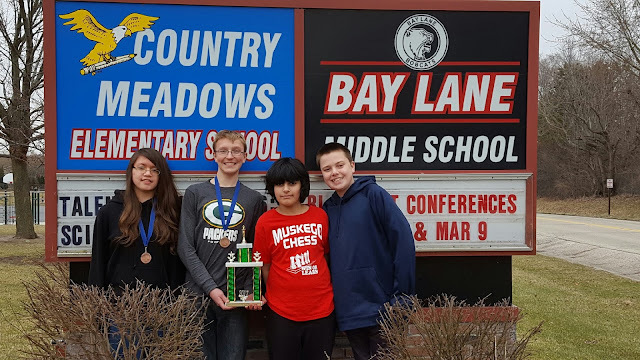 This was the first tournament for 3 of our players - Jack, Kashyap, and Gideon, and they all did great, getting 3, 3, and 2 points, which awesome for their first time! Rishi let the way with 4 points and a 9th place finish, and Anthony was right behind, also with 4 points. Steven led the group with 4 points and a 13 place finish (also earning his red wrist band! ), and Nate was right behind, also with 4 points. This was a big section for us with 9 players. Adam channeled all of his birthday energy into winning 5 of 6 and taking solo 2nd place! Tom had a break through day with 4 wins (also earning his red wrist band!) and a 12th place finish. The team of Tom, Nathan and Grant took 5th place team! Alyssa led the way in this group with 3 wins out of 5 and a 5th place finish! Randy put on a good tournament and we're looking forward to next year's. Thanks to Leah for keeping track of scores and to all the parents who helped keep some "order" :) during the long day. Also thanks to Mr. Ryan for stopping by for several hours and helping many of the players go over their games. Our club has a lone player, Joshua Kreuser (Tess Corners), attend the WSCF Butler middle school tournament in Waukesha this past Saturday, and he did a fantastic job! Josh finished with 3.5 / 5 points for an 11th place finish (5 way tie for 6th). Congratulations to him earning his red wrist band! If you want to go to a tournament (after chess season's over ) & don't mind traveling, this is a fun one to go to. There's a Water Park & a Game Room that the players (& families) can go to in-between rounds or at night to relax.